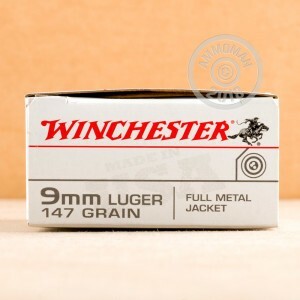 Winchester's Train & Defend ammo is the perfect option for practicing with your carry pistol! Each round is loaded with a 147 grain full metal jacket bullet, making it great for target training. These FMJ's are specifically designed to exhibit similar ballistic trajectories to their paired JHP's of the same grain. This should allow you to feel comfortable with their performance in a self-defense scenario. With their economical pricing, more money will stay in your pocket while keeping you prepared to use your weapon. 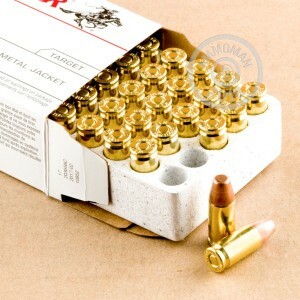 The "Train" load in this product is a 9mm Luger featuring a 147 grain full metal jacket bullet, which leaves the muzzle at 950 feet per second. They come packaged in boxes of 50 (with 10 boxes in a 500-round case) and use non-corrosive Boxer primers with reloadable brass cases. 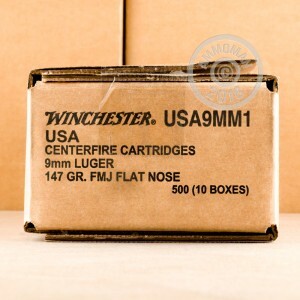 Like other Winchester ammunition, they are loaded in Oxford, Mississippi. Grab a case today and put some holes in some paper bad guys! AmmoMan.com provides free shipping on all orders over $99 including large cases like this one! Great round. Functions flawlessly in my Glock 43. Excellent training and carry round.long bullet ogive great functioning!